This article has quite a title but here is some information for your consideration. First, I will define Oriental Rug for you, so there is no confusion. An Oriental rug is a hand-woven rug of either wool, silk or cotton (the longest wearing being wool) woven in what was once called the Orient as opposed to the Occident. The Orient being the Eastern Hemisphere or the countries East of the Mediterranean and the Occident referring to the Western hemisphere including Europe, North and South America. A Persian Rug is an Oriental Rug that was woven in Iran or the former Persian Empire. Why is this such a beneficial product? First of all, a good quality rug; one that is woven with hand-spun wool and vegetable (plant based) dyes will outlast and out perform any machine made copy and minimally should be in excellent condition by the time you are starting to consider who you will leave it to! It will be durable, stain resistant (as the natural lanolin in the wool will still be there) and give you many years of enjoyment, enriching your home environment. It will not exude fumes or carcinogenic chemicals, unlike many of the synthetic rugs or rugs dyed with chemical dyes. It will not readily burn. If placed in front of a fireplace and a few sparks land on your rug, they will go out. The properly chosen rug will not only add beauty and warmth but a few decorative rugs on the walls can easily lower your utility bills. Many of the weavers that make tribal rugs (nomadic or former nomadic people now living in small villages) are women and they are able to work from home, tending to their families as needed and yet contributing this beautiful art form and income to the household. Your rug purchase helps such individuals and their families, particularly if you seek out an ethical rug merchant that is procuring his or her rugs from reputable resources. An additional concept for your consideration is that nothing was killed to make this beautiful home furnishing item. The sheep will grow new wool, the plants used to make the dyes will grow new leaves, roots, husks, etc., and you will be helping these skilled artisans survive in places on this planet that are in short supply of good jobs. Purchasing a rug woven with natural dyes (an interchangeable term for vegetable dyes or plant based dyes) will allow you to confidently decorate your home as many of the color combination fit easily with an array of decorating styles, natural wood or bamboo flooring. A good rug just adds a touch of beauty and heart to a room and often brings new life to older pieces of furniture, almost elevating them up to antique status! If you were to look under a microscope at vegetable dyed wool as opposed to the modern chemical dyes that are in a large number of hand-made rugs being offered and all the machine made rugs available, you will see that there are variations of color throughout the wool dyed with the vegetable dyes. This is not so with the man-made chemical dyes (German and Swiss made chromium based dyes) as the colors have a tendency to be much more strident and flat. The naturally dyed rug approximates the true value a color appears to the naked eye in nature and is more soothing and acceptable. Hence, another added benefit is the calming, inspirational or spiritual essence that the rug imparts. The colors of the ocean, the forest, the mountains…this variegated quality is everywhere and anywhere in the natural world including your living room. Beautiful, safe, sustainable and makes your heart sing. What else do you need? I genuinely believe this is one of the most undervalued art forms in the world. 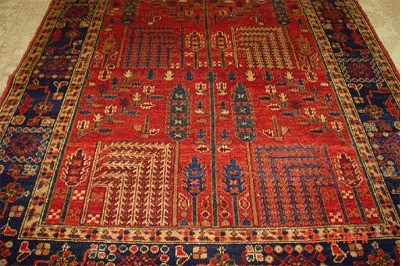 Paintings titled by famous artists sell for millions of dollars while these wonderful rugs, sometimes taking many months to weave can be obtained for relatively small sums of money for the value received. I actually think the right rug might possibly help to lower a person’s blood pressure but I can't verify that one with any medical testimonials. My last comment being tongue in cheek, of course! As you can see I am a firm believer in the merits of village or tribal rugs woven with plant based dyes and the very best hand-spun wool and I invite you to investigate the subject. I assure you, you will be delighted, fascinated and very possibly inspired!